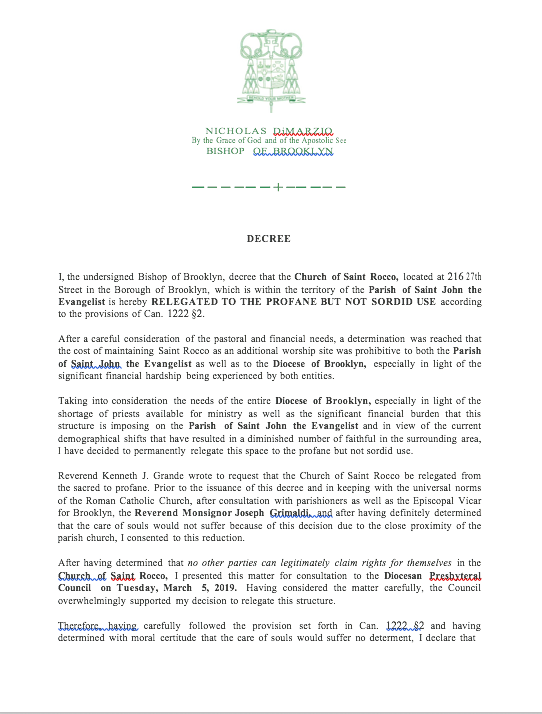 I, the undersigned Bishop of Brooklyn, decree that the Church of Saint Rocco, located at 216 27th Street in the Borough of Brooklyn, which is within the territory of the Parish of Saint John the Evangelist is hereby RELEGATED TO THE PROFANE BUT NOT SORDID USE according to the provisions of Can. 1222 §2. After a careful consideration of the pastoral and financial needs, a determination was reached that the cost of maintaining Saint Rocco as an additional worship site was prohibitive to both the Parish of Saint John the Evangelist as well as to the Diocese of Brooklyn, especially in light of the significant financial hardship being experienced by both entities. Taking into consideration the needs of the entire Diocese of Brooklyn, especially in light of the shortage of priests available for ministry as well as the significant financial burden that this structure is imposing on the Parish of Saint John the Evangelist and in view of the current demographical shifts that have resulted in a diminished number of faithful in the surrounding area, I have decided to permanently relegate this space to the profane but not sordid use. Reverend Kenneth J. Grande wrote to request that the Church of Saint Rocco be relegated from the sacred to profane. Prior to the issuance of this decree and in keeping with the universal norms of the Roman Catholic Church, after consultation with parishioners as well as the Episcopal Vicar for Brooklyn, the Reverend Monsignor Joseph Grimaldi, and after having definitely determined that the care of souls would not suffer because of this decision due to the close proximity of the parish church, I consented to this reduction. After having determined that no other parties can legitimately claim rights for themselves in the Church of Sai.nt Rocco, I presented this matter for consultation to the Diocesan Presbyteral Council on Tuesday, March 5, 2019. Having considered the matter carefully, the Council overwhelmingly supported my decision to relegate this structure. Therefore, having carefully followed the provision set forth in Can. 1222 §2 and having determined with moral certitude that the care of souls would suffer no determent, I declare that this decree will take effect thirty days (30) after its publication and that by virtue of the same the Church of Saint Rocco will no longer be used for divine worship. In addition, I order that any sacred furnishing and artwork, which the Parish of Saint John the Evangelist does not retain for its own use, be disposed of in a manner befitting their character and the known intentions of any donor. Furthermore, in addition to the usual requirements of law for the valid and licit alienation by the parish of the property concerned, the sale of the church is subject to my approval as being constant with the requirements of Can. 1222 §2. Given in Brooklyn, New York, this 9th day of April in the Year of Our Lord, Two Thousand and Nineteen.